COMBINE onions, 2 tablespoons water and granulated sugar in large skillet. Cover; cook over medium heat, stirring occasionally, for 15 to 20 minutes, adding water, a tablespoon at a time, as needed. When onions are soft, uncover and continue to cook, stirring frequently, for about 20 minutes or until the onions are very soft and medium golden brown. Remove onions from skillet to bowl. POUR 1 tablespoon olive oil in the skillet. Add sliced mushrooms. Cook over medium heat, stirring frequently, for 4 minutes or until mushrooms have softened and are coated with a brown sauce. COMBINE pumpkin, remaining 1 tablespoon olive oil, garlic, thyme and cumin in small saucepan. Cook over medium heat, stirring occasionally, for 5 minutes. SPREAD half the pumpkin mixture over one crust. 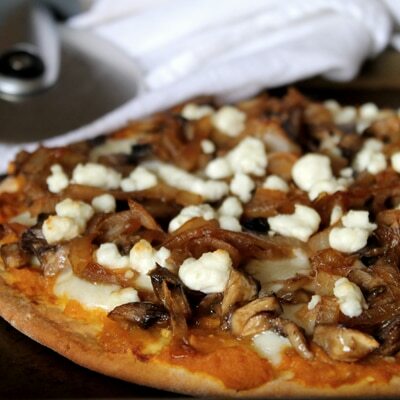 Layer with 1/2 cup mozzarella, half of the caramelized onions, half of the mushrooms and half of the goat cheese. Repeat with the remaining crust. BAKE for 8 to 10 minutes or until the goat cheese is slightly golden and mozzarella looks melted.